Four performances, four protests. Our numbers ranged from three at one show to as many as 10 at another. The Carson & Barnes circus arrived in Missoula, MT for shows on July 9th and 10th, and no show went without protest. You might know C&B from the eye-witness account of one ex-employee. Or perhaps from the widely-circulated, much-condemned elephant training video (“Make ’em scream!”). The footage includes a sadistic training session, caged bears neurotically pacing and bobbing, and an elephant getting her hair burned off with a blow torch. Apparently this was filmed before the waxing craze. One can only surmise that their hair, which is supposed to grow on their bodies, somehow interferes with the performance. Perhaps it’s just too scratchy for the pretty circus lady who clambers up on Jumbo! The C&B Elephant Care page says hair is “often…removed with clippers; this helps to prevent parasites from growing on their skin.” Wild elephants, who don’t shave, wax, clip, or torch, wallow in mud and dirt to protect their skin. They feel mosquitoes landing but love the blowtorch? 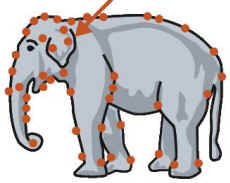 You’ll find a more authoritative view of elephant skin at the Elephant Information Repository. Their skin, it states, is “… not particularly thick, except over the back and sides where it can be 2-3 cm thick.” Not being much of a metrics wiz, I had to grab a ruler and check that out: 2 cm is a little under an inch; 3 cm is a little over. But that’s just on the back and sides. Where you see the prods and bullhooks in use, the skin is much thinner and subject to pain and injury. But let’s return to the idea that “they seem to love” the blowtorch. As we stood with our protest signs outside the entrance gate prior to the 5 p.m. show, a carload of attendees from the 2 p.m. spectacle left the fairgrounds. The driver, a young woman, rolled down her window to tell us, “The animals seemed truly happy!” Funny, innit? how our species has a propensity to justify–based on nothing (on what seems to be)–what we want to believe, to the point of delusion. The zoo animals seem so happy–they don’t have any worries! Bet you’ve heard that one, too. Many looked straight ahead without acknowledging our presence. Others read the signs, then showed an annoyed or amused and sometimes bemused face. All but one group went in. I wonder if, when the animal acts were rolled out, the slightest bit of doubt crept in to deliver small jabs and prods at their conscience. Let’s hope so. Here’s a hearty thank you to those parents for the lesson in compassion and justice they taught their children that day. And here’s another for anyone who has ever held a sign, written a letter, or spoken up in peaceful protest of the oppression and exploitation of another–of any species. “Our lives begin to end the day we become silent about things that matter,” said Dr. King. How wonderful that you made a difference in the lives of one lone family. May those children grow up to be sanctuary founders and animal-rights lawyers and vegan legislators. The members of that dear family have more compassion and integrity in their little toes than does one unnamed singer who will be performing in an unnamed rodeo in Wyoming soon. I’m sure the elephants and tigers feel deep gratitude to the little family who bravely turned back at the gate instead of paying to see — and perpetuate — the hidden cruelty. Wasn’t it Gandhi who said something like, ““First they ignore you, then they laugh at you, then they fight you, then you win”? Thank you Kathleen and those who protested with you, and, wow, I’m heartened by the family that turned away from exploitation, so an extra thank you to them. Thanks to each of you for speaking up for those who have no human voice. Your efforts are appreciated. Stand in solidarity for animals for we are their voice. move to change the violence towards animals.